Greetings friends and fellow crafters, LeeAnn here with a project I made using Lawn Fawn's Simply Celebrate Winter Stamp Set. 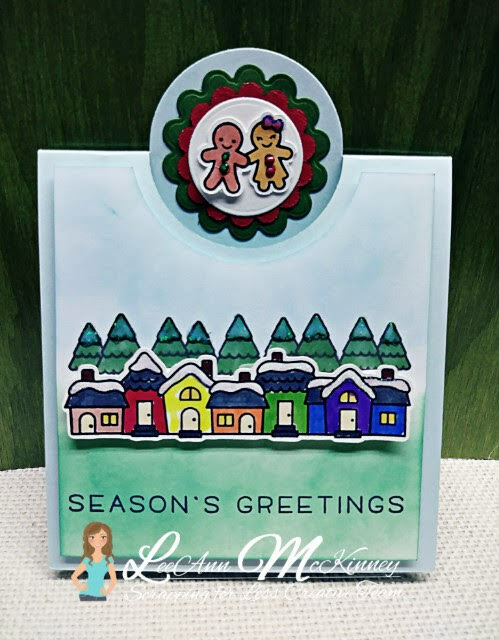 This stamp set is so adorable with its gifts, gingerbread cookies, trees, snow people, ornaments, winter village and the Season's Greetings" sentiment. With all the cute items it was quite hard to decide what I was going to use for this project, but after thinking I came up with a fun idea. I used a pre-made card base from my stash, and a panel that fits the top of it, I used Distress Oxides in Broken China on the sky and a combination of Lucky Clover and Twisted Citron for the ground. My stamping is all done with my Tim Holtz Stamp Platform using Memento Tuxedo Black ink. My coloring is all completed using Chameleon Markers in various colors. I used Nuvo drops in Woodland Green and Autumn Red on the Gingerbread kids buttons. I used my Black Glaze pen on the eyes. I used Nuvo Crystal Drops on the rooftops and tree tops to simulate snow. This project was fun and I am so happy to share it with you today. Its Embellishment Week at White Rose Crafts!!! Happy Fall Y'all, Caramel Apple Season is here!! !